This old car garage turned restaurant serves pub grub with a modern twist, serving pizza, pasta bowls, and yes… cheeseburgers. With cool, industrial Detroit-style décor and a wide selection of craft brews, Vinsetta Garage is the perfect place to get a group of friends together for the evening. Be warned—this place gets packed every evening, so show up early! “The 3 A.M.”- This burger is what started my fried egg, sriracha mayo obsession. According to the Vinsetta Garage menu, this burger is a “half-pound Vinsetta blend patty, [with] Swiss, Woodshop MI maple bacon, topped with a fried cage-free egg & crispy fried onion strings, [and] Sriracha mayo”. If you like a messy burger (and let’s be real, some of the best burgers are the messiest ones), then this one is for you. My advice is to start with the loaded “Disco Fries” as an appetizer, or the chips n’ dip for lighter fare, and then order the 3AM with a side of Vinsetta’s award-winning “Union mac” n’cheese. You’ll be so full that you won’t be able to get off your couch, but in a good way. I consider Checker Bar’s burgers to be a secret weapon of sorts. Located on the corner of Cadillac Square and directly below my favorite barcade Pop + Offworld, Checker Bar is the dive bar of my dreams- a “true Detroit original”, according to the bar’s website. There are two burgers I recommend on the Checker Bar menu. The first, because I’m predictable, is the “Breakfast Burger”: a half-pound or third-of-a-pound ground beef burger with fried egg, mayo, bacon, and cheddar cheese. Brought to your table still piping hot, this burger is greasy perfection. The second burger, for my barbecue fans, is the “Blues Burger”—with “blue cheese, sugar glazed peppercorn bacon, bourbon honey BBQ sauce”. This burger has a great combination of sweet, spicy, and salty that just… works. Ugh, I’m getting hungry. 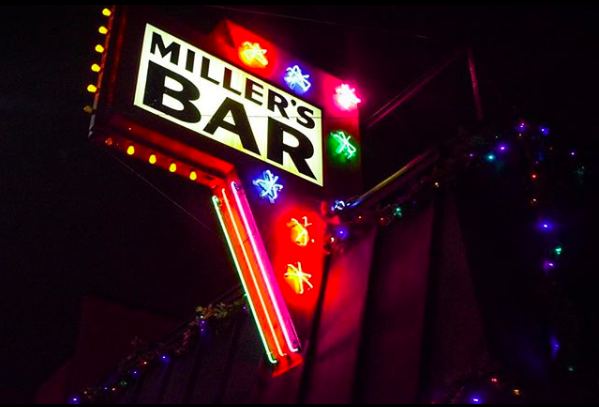 I think most people would agree that Miller’s Bar has the best burgers in the city of Dearborn, and that’s really saying something, because Dearborn is full of amazing burger spots. The bar is a Michigan staple—serving beers and “no-frills” food for almost 80 years. What to order: A burger. With cheese. And if you’re me, you also get pickles, ketchup, and mustard. Miller’s doesn’t mess around with different burger flavors. They just know how good they can make a standard burger and roll with that. I think Redcoat is a great place to take a date… especially if your date has good taste in burgers. I guarantee that you could ask any metro-Detroiter and Redcoat Tavern would be in their top 10 for best burgers in the area, maybe even top 5. MLive awarded Redcoat Tavern with Detroit’s best burger, and Thrillest ranked it Number 9 of the best burger places in America. What to order: Everything at Red Coat Tavern is good. As far as Redcoat’s burgers go, I’ve always stuck with the “Classic”—a perfectly seasoned half-pound patty with a “special” mayonnaise sauce that is to die for. The menu allows you to customize your burger with a variety of different buns, cheeses, and toppings. My preference is the Classic with cheddar, bacon, fried egg (duh, of course), and sometimes sliced avocado. Do yourself a favor and get yourself a side of mac n’ cheese with that beautiful burger of yours. These are only a few of my go-to spots. Other honorable mentions include Dearborn’s Brome Modern Eatery and Taystee’s, Detroit’s Green Dot Stables and Mercury Burger & Bar, Livonia’s Bates Burgers, and more. My list has so much room to grow, so please leave a comment telling me some of your favorite places as well! My fellow metro-Detroiters, aren’t we so lucky to live somewhere with so many different good food options?